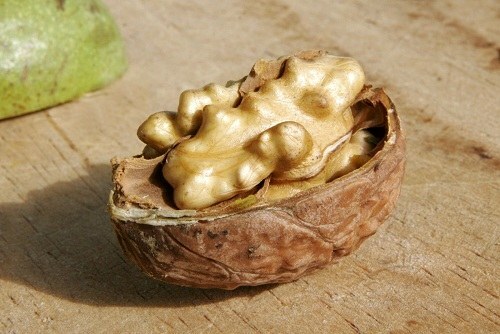 Walnut was used in folk medicine since ancient times. Today it produces various medicinal drugs, which have tonic, anti-microbial and anti-inflammatory actions. In addition to delicious kernels, walnut, there are many other, not less valuable. In leaves and pericarp of walnut contains a lot of necessary for human organism trace elements, iron salts and cobalt, essential oils, tannins and vitamins rare groups (E, K, P). The kernel of the nut is full of oil, protein, amino acids. Walnut is very high in calories (100 grams contains 650 calories). 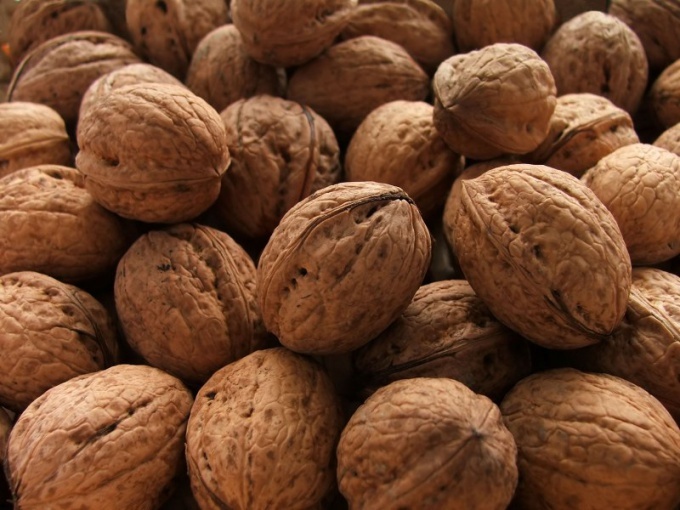 Despite the large fat content, walnuts reduces the level of fats and cholesterol in the blood. 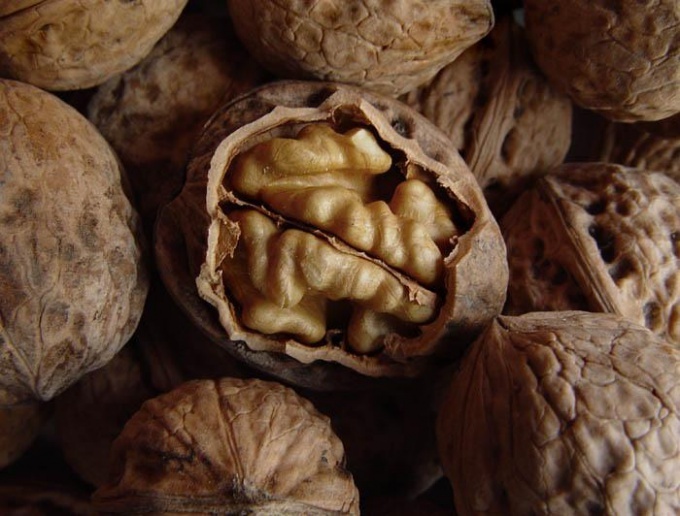 The kernel of walnut is used to strengthen blood vessels. When treatments are used shell, rind, leaves and juice. Important value have also partitions the core of young walnuts that contain iodine. From them prepare alcohol tinctures and medicinal teas. Because partitions contains a lot of iodine, the tincture can be used for prevention or treatment of diseases of the thyroid gland. Such disease the most susceptible are those people whose profession is associated with radiation (doctors-radiologists, oncologists, nuclear power plant workers, office workers, working all day at a computer). Also iodine deficiency experience a pregnant and lactating women. The infusion of the kernels of walnuts are useful for people suffering from memory disorder, atherosclerosis, bowel disease, stomach, arterial hypertension, diabetes mellitus, colitis. It cleanses the body of toxins, normalizes metabolism, improves hormonal balance, strengthens the immune system. The elderly, and women and men who have reached the fortieth anniversary of tincture also does not hurt. After all, after 40 years, begins rebuilding the body. In women there is a risk of development of mastitis, fibroids; in men — BPH and prostatitis. As with any medication, tincture of partitions has its contraindications. It is strictly forbidden to use for people with acute gastritis, allergies, suffering from urticaria, angioedema. But still, even if there is no predisposition to these diseases not to use the tincture, you should consult a doctor. The preparation of alcoholic tinctures not so difficult. The kind of cooking depends on what treatment the tincture will be applied. In diseases of the thyroid gland and associated conditions: a bottle made of dark glass to 1/3 fill the walls of the nut, the remaining space pour alcohol or vodka, cork tightly and put on 3 weeks in a cool place. The same tincture can be rubbed arthritic joints, rheumatic places, to make compresses on the spine. In diseases of the intestines, atherosclerosis, diabetes, gastric ulcer: in a coffee grinder to grind two tablespoons of dried partitions walnut pour in the mayonnaise jar, pour vodka or alcohol and insist in a dark (not necessarily in a cool place for 10 days. Then strain and drink one tablespoon 15 minutes before meals. These tinctures can disinfect minor cuts and wounds. They will be much faster to heal. Walnuts contain protein, sugar, oil, vitamins, minerals and tannins. However, partitions walnuts have not less valuable composition. They have long been used in folk medicine for the treatment of endocrinological, gastrointestinal, broncho-pulmonary and other diseases. For the preparation of tinctures , the partition of 250 g walnuts, pour 0.5 liters of vodka. It is desirable that the bottle, which infused the walls were made of dark glass. Put it in a cool place for 2 weeks. Daily shake the contents of the bottle. The finished tincture has healing, bactericidal, anti-inflammatory, hemostatic and tonic properties. In addition, it can be used as antihelminthic and antiallergic funds. In violation of the bowel (colitis, enteritis, functional disorders, etc.) drink the infusion of partitions of walnuts twice a day. 7 drops of ready-to-use dilute in a tablespoon of cold water and consume on an empty stomach. The course of treatment is long — about a month, but the recurrence of the disease after it is not seen. Tincture of partitions walnuts helps to regulate sugar levels in diabetes. Dilute 10 drops of tincture in a tablespoon of water and drink on an empty stomach. If necessary, you can increase the reception frequency to 2-3 times a day. The course of treatment is 6 weeks. After a 10-day break, therapy can be continued. To improve the functioning of the cardiovascular system drink 5 drops of tincture partitions walnuts 3-4 times a day. Alternate 2-week receiving infusions with weekly guests. The total duration of treatment — up to six months. Partitions of walnuts are rich in iodine, so the infusion helps in diseases of the thyroid gland. Drink it at half a teaspoon twice a day for two weeks. If necessary, repeat the course a month and a half. To treat cough drink infusion 4 times a day on a teaspoon. Take it with plenty of water. The course of treatment is 3-5 days.